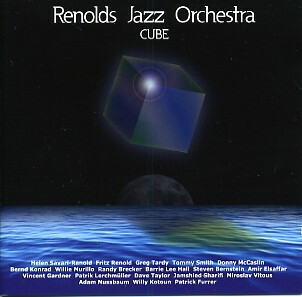 Cube is a suite whose subject is “the Deity’s great effort to restore peace and union with mankind.” The international orchestra includes top players like Randy Brecker, Miroslav Vitous, Greg Tardy, Donny McCaslin, Tommy Smith, Steven Bernstein and Adam Nussbaum. The music was composed and arranged by Fritz Renold, who also plays reeds, with lyrics by his wife, vocalist Helen Savari-Renold. Cube is a stunning example of SACD surround sound. Engineer Klaus Genuit creatively arrays the music across 5.1 channels and conjures a believable three-dimensional ambient environment. It is an illusion simply not achievable in the two-channel world. The sound matters because of the music. Fritz Renold’s charts render ambitious themes in meticulous detail. The high resolution of SACD captures the clamorous power of this ensemble, but also its inner nuances: the shifting layers of backgrounds behind soloists, the clean edges of the sectional counterpoint. Soloists are assigned specific roles in the musical narrative. Tenor saxophonist McCaslin is the Apostle Peter on “The Rooster Crows.” Peter denied Christ three times—raucously, in McCaslin’s depiction. On “Caiaphas,” Tardy’s snaky clarinet evokes the character of the high priest who brought Jesus before Pontius Pilate. Some of the strongest portrayals come from players who will be new to the U.S. audience. Both baritone saxophonist Bernd Konrad and trumpeter Amir ElSaffar give vivid voice to Christ’s agony on the cross. The least successful elements of this album are the stilted lyrics and the wavering vocals of Helen Savari-Renold. But Cube establishes Fritz Renold of Switzerland as a composer/arranger to watch. His writing is sometimes quietly fervent as a prayer, more often sweeping and aspirational, and always erudite in its use of jazz and classical and ethnic sources. Not since Duke Ellington’s group of Sacred Concerts has an orchestra been so able to successfully mix Biblical teachings without compromising musical integrity. Lead by saxist Fritz Renold, and featuring his wife Helen on vocals, the RJO gives the biblical account of Christ’s passion, resurrection and ascension in a way that keeps both the lyrics and music from interfering with one another. Helen’s voice, flexible enough to sound convincing in a Sephardic/middle eastern intonation (“Grave Intrigues”) or in a more Broadway genre (“The Great Commission”) uses the words as a part of the musical whole, rather than being the centerpiece, and dominating each song. The musicians, some of the best around (Greg Tardy, Donny McCaslin, Randy Brecker, Miraslav Vitous, Adam Nus sbaum) work through arrangements that mix Ellingtonian harmonies with Mingus-like episodes of freedom and exploration. Tardy has a clarinet solo during “Caiphas” and “Ascension”, and Willie Murillo delivers a trumpet solo during “Eloi Eloi” that perfectly capture the emotions of the scene. You don’t have to be a regular church goer to get a lot out of this disc; it delivers on multiple levels. Play it during the Easter season along with Bach’s “St. Matthew’s Passion” and see how music has progressed in a few hundred years. Best big band recording in a long time. When are they coming to our church? The music to this unapologetically Christian jazz suite is spectacularly good, the religiosity less so. We'll take the subjects in that order. The Renolds Jazz Orchestra is an 18-member assemblage of highly polished musicians, the best known of which on these shores will be Randy Brecker, Adam Nussbaum, and Miroslav Vitous, the last of whom I'm exceedingly happy to see in print once again outside the ECM nest, having been entranced as a lad with his membership in Weather Report, simultaneously considering Mountain in the Clouds, a 1972 solo, to be one of the great jazz LPs. The RCO indeed acts as an orchestra but one the likes of which is only rarely heard, blending nearly every possible kindred mode into a breathtaking collage handled with consummate grace and daring. What the RCO is doing hasn't often been heard, though I'll liken it in passing to Anthony Davis' killer Ghost Factory and other neoclassically symphonic work. The blend of mid-Eastern sounds—Egyptian, klezmer, Arabic, Carnatic—is central to everything, with Helen Savari-Renold's vocals verging on the melismatic while delivering the Passion of the Christ in simplistic poetics (oft with clumsy grammatic inversions, though). Mrs. Renolds, married to sax player Fritz Renold, has a quicksilvery liquid voice tolling like a meadowlark calling the faithful to prayer from a minaret—slurring, trilling, gliding through sonic mosaics and desert sands, guiding the listener through a caravanserai. Ceaselessly transmorphing in big band, atonal, trad jazz, neoclassical, and classical modes, the path of each player's lines is drop dead fascinating, a perpetual flux of innovation and variance. In the opening cut, Grave Intrigues, for instance, while following a trumpet line well into the composition, the accompanying tempo shifts before you even realize it. Switching attention to that, the symphonic background component then changes, and, ere long, it's obvious that Cube is going to be one long uninterrupted fest of extremely subtle and complex transfigurations, the only real consonance lying in intermittent brass orchestra sections, which themselves do not remain long static. Everyone gets a chance to shine many times over in a profusion of entrancing solos; thus, no one grabs the light as a celebrity standout, not even the celebrities. If there's such a category as progjazz, and I'm not sure the pigeonhole exists, this is immediately one of its prime exponents. The disc is not really fusion per se, functionally going far beyond even that adventurous genre's boundaries in the most refined of ways, nor is it of the ilk of Strata Institute, Erkki-Sven Tuur, and the more outré ensembles, because there's so much in RCO's euphoric melting pot. Renold's voice is the least featured ingredient in the deleriously long concept work (71+ minutes! ), which really could have incorporated her marvelously gymnastic stylings more fully—in more than one way, she's the emergence of a new Flora Purim. The absence of what should have been a more fulsome ingredient doesn't hurt the disc in the least, but a more prominent display could only have helped ever more generously atop manifold excellences. Now the religious element. As an atheist ex-Catholic and present zenarchist, I'm more than familiar with the storyline here but do not in the least agree with it. What marks the falseness of Christianity is the cult's willful failure to recognize Jesus as an anarchist, though the fact is screamingly obvious in the Bible's own words. Beyond the Berrigan Brothers and a few others, I've yet to hear of or happen across a Christian who conducts his or her life as the Christ did. That "-ian" suffix at the end of the designation? It means "like". I see no Christlike Christians, not to any degree. They do not question authority nor do they educate much beyond reflexive conservatisms. Minions most certainly haven't the least inclination to tear into their own greatly wanting scripture, as Jesus did the Judaic tradition, the religious culture he was born into and then rejected from. Christians, in short, are not Christians; that's just a name now hideously corrupted. I have great affection for the example of Jesus and do not appreciate the diminishment thuswise of both his name and work. Instead, what is reputed to be Christianity is just a perenial regurgitation of abnegative servility to a constantly docilized and docilizing mythology (if you're interested, it has its roots in Constantine and the Nicean Councils as versus the Qumran manuscripts, Dead Sea Scrolls and so on). The religion is a system of governance, not even faintly a celebration of spirituality. Whatever Jesus taught, and his lessons were excellent, is honored by Church and laity only in the breach, a sundering that never ends. Thus, may I credit the lyrics here, the motive? Not in the least, it's just another attempt at missionary work, tis time via art, though the music makes all that eminently ignorable, residing, as it does, on such a stellar plane, and to my ears an important work. However, it's the duty of a critic to analyze what's put before him, and I've now done that. One may easily embrace the brilliance of a truly artistic work without honoring the inaesthetic among its motives. Let This Blood be Upon Us! All music composed by Fritz Renold, all lyrics written by Helen Savari-Renold. Copyright 2008, Peterborough Folk Music Society. "Cube" (Shanti) is a big band and vocal suite based on the Biblical events of Easter. (Reviewing it at Christmastime isn't out of place, considering the main character in each celebration.) The album features an all-star European and American group led by Swiss reedman and composer Fritz Renold. Helen Savari-Renold, his wife, handles vocals. The 10 performances, from "Grave Intrigues," early warnings of Jesus' trial to come, to the finale, the title composition, with Jesus reigning in heaven. Renold writes with an appreciation for Duke Ellington's brass and woodwind colors, Stan Kenton's brassy grandeur, Dizzy Gillespie's use of Afro-Cuban rhythms and Stravinsky's harmonic audacity. Middle Eastern modes snake through performances as written melody or improvised motifs. Well-integrated solos abound: Amir Elsaffar's sinuous, buzzing trumpet and Miroslav Vitous' dark, ominous bass on "The Potter's Field"; Donny McCaslin's register-leaping tenor saxophone on "The Resurrection"; and Vincent Gardner's swinging trombone on "Ascension," to name a few. Drummer Adam Nussbaum and percussionist Willy Kotoun prove fine groove masters. Savari-Renold sings with a high-art concept akin to what Ellington envisioned for vocalists in his sacred suites. All rights reserved. This copyrighted material may not be published, broadcast or redistributed in any manner. An international orchestra, Renolds Jazz Orchestra, led by Swiss reedman Fritz Renold with his wife Helen Savari-Renold handling the vocals (she is also the lyricist), is heard on a marvelous recording of the big band suite “Cube.” Among the international cast on reeds (besides Renold) are Greg Tardy, Tommy Smith, Donny McCaslin, and Bernd Konrad. The trumpets include Willie Murillom, Randy Brecker, Barrie Lee Hall, Steve Bernstein and Amir Elsaffar. On trombones are Vincent Gardner, and David Taylor, while the rhythm section has Jamshied Sharifi on piano, Miroslav Vituos on bass, Adam Nussbaum on drums, with Willie Kotoun on percussion and Patrick Furrer conducting. Elsaffar’s trumpet over a rhythm that seems to escape time, and Tommy Smith’s soprano crying like a lost snake-charmer before Vituos takes a bass solo. The contrasting tenor sax styles of Tommy Smith and Donny McCaslin spar on “Let This Blood Be Upon Us!” with the solos increasingly framed by Renold’s arrangement before Vitous trades fours with saxes and brass prior to Sharifi’s piano break with the transitions in tempo and musical tone seamless here as throughout this disc. “The Rooster Crows,” where Helen sings about Apostle Peter’s denying his friendship with Jesus, almost comes off like a big band blues as McCaslin tears into his solo. It is followed by “Eloi, Eloi, Lama Sabachthani,” opening with the rumbling, wailing bass clarinet of Bernd Konrad, with trumpet cries leading into the band with a flamenco accent climaxing prior to a vocal pondering the suffering of the crucifixion. The remaining four pieces celebrate the Resurrection, the message of his regenerated life and ascension into heaven with the finale being the title track celebrating creation. McCaslin and Barrie Lee both take brilliant solos on the soaring “The Resurrection,” while “The Great Commission,” has a more contemplative flavor that caresses Randy Brecker’s solo with flutes being imaginatively weaved in the arrangement.